Yes, I do mean pins, those little straight pointy things few people use any more and those of us who do tend to take for granted. Only straight pins, also known now as common pins, were available in the Regency. The safety pin was not invented until 1849, in America. Regency pins did not look like pins of today, because they were made quite differently, of different materials. Nor were pins used only for purposes of sewing during the Regency. People had other uses for pins which would probably not occur to most of us today, with the exception of some of us who enjoyed a significant number of decades in the last century. Pins in one form or another have been in use so long, since at least 3000 B. C., that it is impossible to know when the first pin was used or of what material it was made. Some believe the first pins were actually thorns from various plants. It is known that, even as late as the early twentieth century, in England, and certainly during the Regency, many gypsy bands sold pins made from thorns which they had boiled in oil to toughen and harden them. The prefered thorn was from the blackthorn, ideally those from new shoots, which were easy to harvest, as well as being quite fine and sharp. Other materials from which early pins were made include fish and animal bone and horn, as well as iron and bronze. The English word "pin" is derived from the Latin word pinna, meaning point, while the French word for pin, épingle, also comes from a Latin source, spinula, which means thorn. Straight pins were more routinely made of metal in Europe by the Middle Ages. They were very popular with the upper classes, particularly ladies, primarily as the most convenient means of securing their expensive clothing. To prevent the loss of their pins, some people went so far as to attach them to their garments with fine threads or strings. Even so, pins were often lost and had to be replaced. But the pin-makers of Europe could not keep up with the demand for this highly-prized luxury, even though the price of pins at that time was quite exorbitant. Demand for pins in Britain became so extreme that, in the fourteenth century, Parliament passed a law which restricted the days on which pin-makers could open their shops to sell their wares to 1 and 2 January of each year, only. High-born ladies of fashion flocked to the pin shops of England on those two days, carrying purses heavy with the money their fathers or husbands had provided them for the purchase of their annual supply of pins. Thus originated the term "pin money." Over the centuries, as the price of pins came down, this annual sum provided to a woman was also expected to cover the cost of her entire wardrobe for that year. From at least the eighteenth century, many women had an annual or quarterly amount for "pin money" provided to them for their exclusive use, by the terms of their marriage settlement. It was also a practice by that time for customers settling an account for which they received good service to add a few extra coins, with the remark to the merchant, "Pin money for your wife." During the Regency, "pin money" was still provided to most women of means by fathers or husbands, and at that time was intended for the purchase not only of pins, but of ribbons, gloves, fans and other perhaps trifling, but necessary, wardrobe and fashion accessories. By Victorian times, when pins were made cheaply by machine, the term "pin money" took on a new meaning, of a small amount to cover the costs of a lady’s trivial incidental expenses. French pins were of very high quality by the late Middle Ages, and were regularly imported into Britain. To help strengthen the English industry, in 1483, Richard III issued an edict which prohibited the importation of French pins, but it was almost universally ignored. In 1543, Henry VIII also passed a law with the intent of improving the quality of English pins. This law specified that "No person shall put to sale any pynnes but only such as shall be double-headed and have all the heads soldered fast to the shanke of the pynnes, well smoothed, the shanke well sharpen, the point well and filed, canted and sharpened." Double-headed pins were the most expensive type of pin, having two heads attached to a single shank. They were the most effective for securing garments, particularly ladies’ veils, in place. But only the very wealthy could afford them, and despite its good intentions, this law nearly destroyed the English pin industry. It was repealed three years later. The English "Pinners," or the Company of Pin-Makers, the guild for the trade, did make an effort to improve the quality of their pins, but the real problem was the quality of the wire which was then available in Britain. French pin-making wire was imported until the latter half of the seventeenth century, which did allow the pinners to produce much better pins. But in 1662, during the reign of Charles II, Parliament banned the importation of French pin-making wire. The quality of English pins again diminished, since it was not until the beginning of the eighteenth century that English wire manufacturers routinely began to produce high quality wire. But once they got it right, wire-makers continued to make better and better wire, so that by the end of the century, the quality of English-made pins was consistently superior to those made in France. In fact, English pins then began to be imported into France. By the early nineteenth century, most French women preferred English pins, another luxury they were forced to forgo during the British embargo of France during the Napoleonic Wars. In the fifteenth and sixteenth centuries, pin-making in England had been a cottage industry, with whole families devoted to making pins in their homes. But in 1622, a man named John Tilsby opened what is believed to be the first English pin factory, in Stroud, in the heart of the county of Gloucestershire. Records show that within a year Tilsby was employing at least fifteen hundred workers. More pin factories grew up in the area over the centuries as the demand for English pins increased. By the Regency, Stroud and Bristol were the twin centers of English pin-making. It was not until the late 1830s, when pin-making machines were introduced, that Birmingham became the pin-manufacturing capital of Britain and the hand-made pin manufactories in Stroud and Bristol gradually ceased operations. Pins were made during the Regency in much the same way they had been made since the mid-sixteenth century, and continued to be made in that way until about 1830, when the first pin-making machines were introduced. Denis Diderot included a few illustrations of French pin making in his famous Encyclopédie. Pin-making in England was much the same. Most pins were made of brass wire which was hand-drawn to reduce it to the correct diameter for the size of pin to be made. There were several sizes of pins, and the smaller the pin, the smaller the gauge of wire used in their manufacture. Once the wire had been drawn to the correct size, it was cut into lengths from which would be made several pins. Both ends of the length of wire were in turn held against a grindstone until a sharp point was achieved. The pin-maker then cut off two pointed pin shanks of the correct size, then again pointed each end of the cut wire, again cut off two pin shanks and so on, until only a short length of wire remained. All the wire scraps were gathered together and would eventually be melted down and made into more wire to make more pins. Drawing the wire and pointing the pin shanks was typically carried out by men. The next step in the pin-making process was the heading, and this work was done by both women and children, but seldom by men. Modern pins are made in one piece, with the steel wire of which they are now made forced into a die which shapes one end of the shank into the head. But such was not the case before 1830. 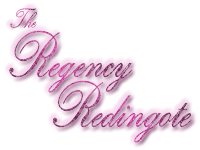 Pins in the Regency were made in the same two-part process as they had been since medieval times. The pin head was made of a separate coil of wire which then had to be attached to the shank, by hand. Initially, the wire used to make the pin head was the same gauge as the wire used to make the pin shank, coiled two or three times. But this resulted in cumbersome heads which were difficult to secure to the shank, and were more likely to snag on fabric. Toward the end of the eighteenth century, more and more pin-makers began to use wire of a thinner gauge than the shank to make the pin heads, then coiling the wire four or five times around the shank. Pin-heads made with this smaller gauge wire were also easier to finish smoothly so that they did not snag the threads of the fabrics they were used to fasten. Pin heads were made by coiling a long length of wire to a diameter just slightly larger in diameter than that of the pin shank for which they were intended. This coiled wire, looking rather like a long, miniature spring, was cut into hundreds of tiny coils of four or five turns. The cut coils were placed into a shallow tray, though some workers preferred to hold the coils in the lap of their apron. With a special tool, often made of bone, four or five headless pin shanks were drawn through the pile of coils point first, each shank picking up a tiny coil. The unsharpened end of the pin shank was slightly misshapen where it had been cut from the length of wire after it was sharpened. This malformation helped to keep the head coil in place until it could be properly secured. Pin heads were secured by placing each pin with the coiled head at the end of the unsharpened end into a special machine which would apply pressure. This machine was operated by a foot-treadle which raised a weighted drop-stamp inside a pair of guide rails. When the head of the pin was placed in the recess in the anvil below, the drop-stamp was released, and allowed to fall onto the pin head under its own weight. The pressure exerted squeezed the coiled pin head tight around the shank and the pin was then fully formed. But it was not yet ready for sale, the final finish must still be applied. A completed pin would bear marks of is manufacture which were not only unattractive, but left rough surfaces which could snag delicate threads. Thus, brass pins were tinned after they were assembled. Batches of pins were placed into a boiling solution of potassium bitartrate, a reddish crystalline substance found in the bottom of wine vats, and thin leaves or small granules of tin. Some pinners used a solution of alloy of tin, mercury and lead for this purpose, though they were unaware this was a much greater risk to their health. Once the new pins were tinned, they were then ready for the final step, "barrelling." The pins were placed in a large barrel with hot sawdust or bran. The barrel was turned by a crank, usually by a strong young boy. The turning motion tumbled the pins over and over with the hot polishing material until they were all clean, smooth and ready to be packaged for sale. Before moving on to the packaging of pins, notice must be taken of a special type of pin, the mourning pin. These pins were black in color, with a matte finish. They were made from iron, rather than brass wire, in the same way that all other pins were made. However, they were jappanned rather than tinned. The jappanning made the mourning pins smooth and was deemed the only finish needed. Mourning pins were not barrelled, as that would have given them a shiny finish, which was considered inappropriate for mourning. Though mourning was not taken to the exaggerated degree it was during the reign of Queen Victoria, during the Regency, people in mourning, particularly women, were expected to wear dark, sombre, dull colors and to avoid wearing anything which sparkled or glittered. Not only were they expected to avoid any jewelry which might twinkle or glimmer, they were even expected to use pins on their garments which would reflect no light. Mourning pins were somewhat more expensive than regular pins until they were made by machine in Victorian times. The packaging of pins has a history all its own. Before about 1744, pins were sold in loose lots, usually measured by weight and then wrapped in heavy paper. But in the mid-eighteenth century, pins were most often sold by the box, though still measured by weight. One could buy a quarter-pound, half-pound or a full pound box of pins, depending on the amount of pins needed. But since they were still hand-made, pins were rather expensive and not everyone need such a large volume of pins per purchase. There was also the problem of poorly made pins, which might easily be slipped into a loose lot or box of pins, unseen by the buyer until too late. To address these two issues, in about 1785, many pin-makers added a new type of packaging, the "paper." A smaller amount of pins was sold, stuck side by side, into a small piece of crimped paper. A "paper" of pins made it possible to buy a small amount of pins at a more reasonable price, as well as enabling the purchaser to closely inspect all the pins on the paper before they made their purchase. Papers of pins proved to be a very popular package format with customers, particularly the ladies, and by 1800, pins were being sold stuck into colored papers throughout Britain. The task of "sticking" pins into these crimped and colored papers was done primarily by women and children. The pin sticker used a special tool which looked much like a hair comb. The tool was literally combed through a shallow tray filled with newly-made pins, picking up a pin, by the head, between each tooth. The pin sticker then pushed that group of pins into a crimped paper, ensuring that they were all even before combing up another set of pins to be stuck into another crimped paper. As noted above, pins were made in several sizes, which necessitated names by which to differentiate each size. The problem for historians is that some pin sizes had more than one name. For example, the smallest pins, just under half an inch in length, were known as minifers, minnikins, lillikins, lillskins or just lills. Lills were most commonly used to secure the fine fabrics of a woman’s clothing in place, such as a veil or scarf. Lills were typically used to secure a fichu, known also as a "pinner," for now obvious reasons, into place to cover a woman’s bodice above a low neckline. Lills may have occasionally been used to hold very fine fabric in place while sewing, but all available evidence suggests they were more regularly used to fasten garments in place. Pins known as short whites were just over an inch long, but fairly thin. Next were middlings, also known as long whites, since they were longer and slightly thicker than short whites. Middlings seem to have been the most common, all-purpose type of pin available during the Regency, owned by most people who needed pins. Both middlings/long whites and short whites were used for most general sewing and dress-making tasks. Blanket pins, also known as double long whites, were about three inches long and much thicker than any of the other pins noted above. They were the largest pins known to have been made during the Regency. Other names for this type of pin were calkins, corkins, corking-pins and cawkins. They were used for fastening heavy cloaks or blankets, as well as furnishing fabrics. These large pins were the type used by many milliners in the making of hats, where a stronger pin was required. Blanket pins were most often used to fasten closed the shrouds of the affluent deceased before they were placed into their coffins. Evidence has been found in several archaeological digs that smaller pins were sometimes used to fasten the shrouds of those of lesser means. Most people assume that pins were primarily used for dressmaking and tailoring, but such was not actually the case. Tailors and professional dressmakers used very few pins in their work. Tailors, in particular, only used pins very occasionally. They would ease the two pieces of a garment into place by hand, basting as they went. Very often, the basted garment would then be tried on the customer to be sure of the fit, before all of the seams would be finally stitched down. Professional dressmakers worked in much the same way, though they might use a few pins to hold straight seams in place before stitching. Home dressmakers might use more pins when they assembled garments than a professional, but not that many more. I sew myself, and I do use a number of pins when assembling garments by machine, but I use as few a possible when sewing by hand, as they tend to poke me as I stitch. I suspect that Regency dressmakers, either professional or home sewers, who had to sew all their seams by hand, also used as few pins as possible. It should also be noted that neither Regency tailors nor dressmakers were likely to put pins in their mouth as they worked, because the wound heads of hand-made pins had a tendency to come off. Mothers routinely reminded their daughters not to put pins in their mouth as well as warning all their children not to scratch their ears with a pin, for fear the head would come off and the child would become deaf. Not rashly to be touched. Because pins were regularly used when dressing, most ladies kept a pincushion on their dressing table. Many also carried a small supply of pins in their reticule when they went out, for emergencies. These pins were often referred to as toilette pins for that reason. But toilette pins made up only a small fraction of the pins sold during the Regency, as they continued to do right though the end of the nineteenth century. In the past couple of months, I have read two books on Jane Austen in which the authors noted that Austen used pins to attach pages of her manuscripts together. She also used pins to attach small slips of paper over areas that had been crossed out on which to write her revised text. Both authors assumed that Austen used pins for this purpose because she did some home sewing and mending and had them handy. A remarkably sexist and "stitchist" assumption. Clearly these authors have not spent much time researching in original papers of that era. Everyone during the Regency used pins for this same purpose, just as they had for more than a century, and would continue to do for at least another century. There were no staples or paper clips available during the Regency, but it was often necessary or just convenient for many people to attach various papers together. From the Middle Ages, the most common means of attaching sheets of paper together was to use a sharp pen knife to cut two slits in the stack of papers. Then a ribbon or string would be threaded through the slits and tied to keep them together. In some cases, the knot of the ribbon or string was sealed with wax, to ensure that group of papers remained together and making it very obvious if they should be separated. But this method of fastening could be rather destructive, particularly to small pieces of paper. From at least the mid-eighteenth century, people regularly used pins to attach papers together. Merchants often used pins to attach a bank note or a bank draft to an invoice to keep them together until the payment could be processed. Legal papers were also secured by pins, as were most business and personal papers. These pins, when used for business, were known as "bank pins." Bank pins were made in exactly the same way as all pins were made during the Regency, but they were packaged differently. Bank pins were sold by the box, not by the paper, and short whites and long whites were the most commonly used sizes. Over the years, working with a wide range of collections of personal papers, I have seen many groups of papers pinned together with these hand-made wound-head pins. Historians and archaeologists have used such collections in an attempt to more precisely date hand-made pins. However, there is so much variation in workmanship that dating of these pins remains problematic at best. By the end of the nineteenth century, bank pins were sold stuck edgeways in a long strip of paper which was then coiled tightly into a small round box in such a way as to create a dome of pins. When I was growing up, there was a rather old-fashioned stationer’s shop near where I lived which carried bank pins in such boxes, up until I graduated high school. Pins were seldom used during the Regency in the ways we use them today. Most women used pins to fasten their garments more often than they did for the purpose of making their garments. English pins were the best quality pins available during that time. There were a number of pin sizes, each with a different name, and used for different purposes. Most pins were made of brass, coated with tin, with the exception of mourning pins, which were made of iron and lacquered. Toilette pins were sold in small amounts, stuck into colored, crimped papers, which is how most ladies purchased their pins. Professional tailors and dressmakers were more likely to buy bank pins, by the box. They were also more likely to use pins to attach payments to invoices than they were to use pins in making the garments they sold. Hand-made pins, known as wound-head or spun-head pins, could loose their heads, for which reason most people were careful not to put them in their mouths. So, Regency authors, think twice about those scenes in which a dressmaker is fitting a new gown with a mouthful of pins. No Regency dressmaker would have done such a thing, nor would those ladies who stitched their own garments at home. And how might the heroine employ the many pins which she would have used to secure her garments? Might she pull one free to prick the arm, or other body part, of an unpleasant rake trying to take advantage of her? Perhaps she might use one to startle the horse of the villain, causing it to bolt and giving her a chance to escape. Regency pins were small, but they were a very important part of a lady’ toilette. How might they figure in your next Regency novel? This entry was posted in Apparel & Grooming and tagged Clothing, Jane Austen, Regency. Bookmark the permalink. I am glad you found the article informative and interesting. I am constantly fascinated by how our collective progress through time disconnects us from objects and the knowledge related to them which our ancestors took for granted. I am hoping to restore some of those connections here, at least those to Regency times. Thank you for visiting and please stop by again, soon. I hope you will find more articles of interest here in the future. According to ‘Time Team’, in the medieval/Renaissance period pinmaking was one of the less salubrious jobs in history, the adding of solder heads being a toxic business. I also read that the pinners were often located next to butcher’s shops as ox bones were used to hold the head end against while sharpening the pointed end. C. Caple wrote an interesting article on the changing nature of pins as revealed through archaeology. There were three types of head, those wrapped with a flux added, those merely wrapped tightly, and those wrapped and crimped. According to Caple the length of pin on average diminished with time, being over 40mm before 1500; by the period 1630 – 1730 in a range of 25mm to 30mm, and there is also an increase in the fineness of the wire for the shafts suggesting an improved ability to make finer wire. Finer wires were needed to make shorter pins. From what I have read, pin-making did not become any more fragrant by the Regency. I think that is one of the reasons the bulk of the pin-making industry was located in Stroud and Bristol. Not very upscale areas, and glad for the income, regardless of the smell and the mess. It would seem that the pin-making process did change from the time of the Renaissance, since by Regency times, the pin shank was cut from wire after it had already been pointed and the head was added later. You are also quite right about the ability to make finer wire changing the sizes of available pins. As far as I can tell, the smallest, finest pins, known as lills, were not made until the mid-eighteenth century, when high quality, very fine wire was regularly made. I have just found a piece of paper in amongst my late mother’s sewing items. It is headed ‘The Porcupine Sheet of Best Brass Lillikin Pins and there are still four of them threaded into the paper. I had never heard the term before though I have been sewing for around 60 years. I was so pleased to find so much information when I did a Google search. I will put them away in a little sewing box I was given by a lady who had it as a school prize in 1885. She left some of her pins in there too. What a delightful find!!! I am not surprised that you had not heard the term lillikins. From what I can tell, both the term and those tiny pins had fallen out of fashion well before the end of the nineteenth century, long before you were born. Though I had heard of lillikin pins, I have never seen any packaged in the way you describe. I love that name, “The Porcupine Sheet of Best Brass Lillikin Pins.” You may have the only surviving paper of their lillikins. I am glad to know you are keeping them safe, along with the other pins in your collection. Have you considered taking a photograph of that paper of pins? There may be some scholars who would be interested in seeing it. The best information I found on pins while researching this article was in the book, Findings: The Material Culture of Needlework and Sewing, by Mary C. Beaudry. (And I do not say that because I studied with her during my graduate work). She did painstaking research on a large number of needlework implements which have been recovered from various archaeological excavations in both the US and the UK, including vast numbers of pins. You might enjoy consulting it to learn more about lillikins and other pins. Thank you for taking the time to share your good fortune!